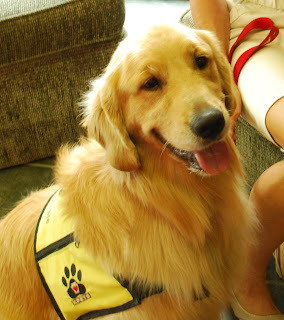 It never ceases to amaze me how these therapy dogs affect peoples’ therapy sessions. Today Max and I went to the Rehab Hospital to work with the physical therapists and their patients. Max and I worked with a gentleman who need to work on balance while seated and using his left arm/hand. We’ll call him “Bob”. 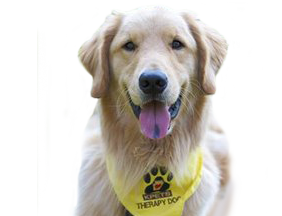 The therapist, (we’ll call Jill) had Max jump up on the mat table so Bob could brush him from his wheelchair. Max gladly obliged and hopped right up. As Max sat close to the edge of the table, his friend leaned forward to brush Max with a little help from Jill and his wife, who was there watching and giving him moral support. Bob brushed Max using his right hand but working on his balance while doing so. After a few minutes, it was time to lean back and take a break. After a brief rest, the next thing we were to help with was having Bob pet Max with his left hand. He was instructed of this next exercise, so he leaned front – without any help! ! Eyes widened and “good jobs” were heard from everyone! He worked hard to lift his arm up enough to pet Max on his back, then stroking him back and forth from shoulders to tail. There were no complaints from Max. He loved every minute of it. Rest time – and as if to say “thank you”, Max was licking his hands. He’s not usually a licker! I apologized but Bob and his wife both said it was fine, as their dog at home was quite the kisser. Now you must know, Max was very thorough when he was kissing his hands; they were ‘schlecked’ on the back and on the palms. I did pull out a wet wipe from my bag and offered it to Bob to clean up. Jill took it and helped unfold the wipe and then handed it to him. He used is left hand to wipe his right – top and bottom. Then he used his right hand to wipe his left. He did the top and Jill asked, “Can you get your palm”. He turned his arm/wrist so his palm was almost face-up. Jill stated with eyes wide, “I didn’t know you could do that!”. His wife said the same! Bob commented, “Me, either. You should name him ‘Miracle Max’“. Not a bad idea! My kids. I’m so proud of each and every one of them!